← Big Cat Restorations – a New Page! 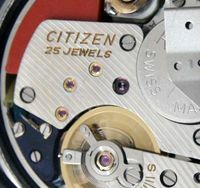 Just done an update on the Chronographs reference page – I needed to make a couple of small corrections to the 67-9038 section, and add new images from a 1970s catalogue. The models in that catalogue, which I think was for the Australian market, shows slight variations. Before going to the page, test your knowledge first 🙂 Can you spot what’s different between these two? 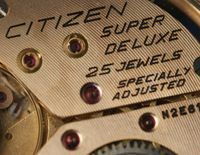 This entry was posted in Vintage Watches and tagged Citizen 8110, Vintage Citizen 67-9038, Vintage Citizen Chronograph 8110A. Bookmark the permalink. 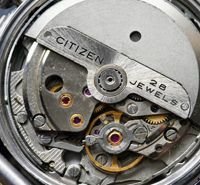 Middle button vs knurled winding crown? 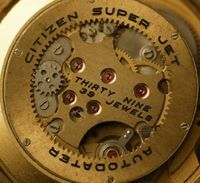 Very nice rare wrist watch. Hi stephen, we have discussed this before, but maybe you forgot it. 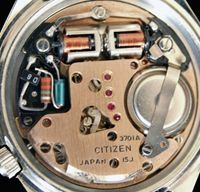 “Australian versions” have totally different tachymeter rings, which I have not seen before. It includes text “Base 15 pulsations” and “UPH” which I believe means “unit per hour”. Units at the beginning of the ring are from 200 to 60 and after that they seem to continue same way as in “normal version”. I believe first units are for measuring heart beat rate and then it continues with Km/h units.